Virat Kohli is the second Indian after Vinod Kambli to score back-to-back double hundreds. Indian skipper Virat Kohli on Sunday became the first international captain to score six double ton in Test cricket. 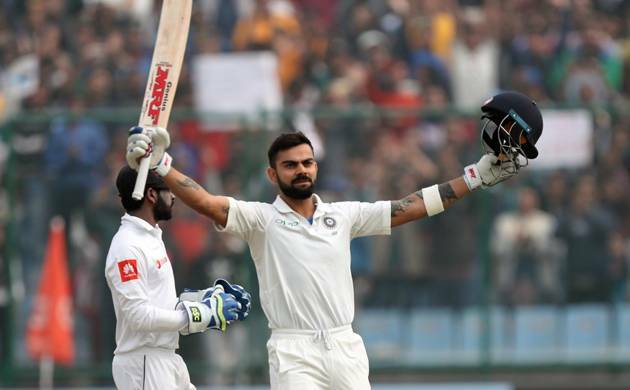 India’s current ‘Milestone Man’, who had emulated Rahul Dravid with his previous double century in Nagpur, on Sunday equalled Sachin Tendulkar and Virender Sehwag for most double hundreds for India in Tests. The 29-year-old scored his record sixth Test double hundred on the second day of the ongoing third Test against Sri Lanka at the Feroz Shah Kotla in New Delhi. He is also only the second Indian after Vinod Kambli to score back-to-back double hundreds. In 1993, the former left-handed batsman had scored 224 against England in Mumbai and 227 against Zimbabwe in Delhi.